For the fifth time, students from the Newhouse School will have the opportunity to study with filmmakers and production companies in Mumbai, India. 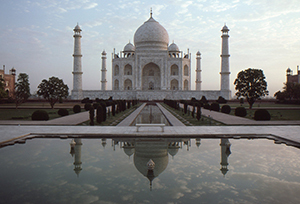 Summer Program: Bollywood Practicum is an SU Abroad course led by Newhouse adjunct Mark Bennington, a renowned photographer and actor with ties to Bollywood. Twelve students will participate in this year’s program, which was developed by Newhouse associate professor Tula Goenka in 2008. The course is taught at leading Bollywood director Subhash Ghai’s Whistling Woods International (WWI) Institute for Film, Fashion & Media, and various other locations in Mumbai. Students will also visit the Taj Mahal in Agra. Participating students include seniors Whitney Marin, Nathaniel Carlson, Aaron Goldsmith, Kyung Seo Han, William Limpert, Kadisha Phillips and Wayne Smith III; juniors Losa Meru, Iara Rogers Benchoam and Veronica Ortiz; and sophomores Sarah Grabman and Erika Douglass. They departed May 16 and will return June 11. Carlson will remain in Mumbai an extra month after the other students have left to intern at production company Trace VFX, where he will work with Newhouse alumnus Jonathan Mason ’06. The students will blog about their experiences at http://subollywood2014.wordpress.com. Follow them on Twitter via #SUBollywood. Bennington lives in Syracuse and maintains a studio in New York City. A few of his clients include American India Foundation, Random House, Harper Collins, Texas A&M University, the U.S. Navy and the Getty Center of Los Angeles. He has been a featured contributor for the Los Angeles Times, the Wall Street Journal India, Forbes, Virginia Quarterly Review and the Times of India, and he recently completed his first photography book, “Living the Dream: The Life of the ‘Bollywood’ Actor.” He recently co-starred in Dibakar Banergee’s “Detective Byomkesh Bakshy,” for release in December. Goenka, who was born and raised in India, has more than 30 years of experience in the film and television industry. She serves as co-director of SU’s annual Human Rights Film Festival. She is currently in post-production on a documentary film on Mithila painters in the Madhubani region of Bihar, India. Her book, “Not Just Bollywood: Conversations with Indian Movie Directors,” will be published this month.